Budapest has been increasing its charm in the last few years as a tourist destination which also led to the revival of the hotel sector. Several investments are running in the city but the renovation of the Parisi- Udvar is outstanding among them. Zuhair Awad and Sameer Hamdan started working in the hotel sector already in 1992 and within two decade they achived the level to be able to develop the second five-star hotel. Mellow Mood Group which has been named by a Bob Marley song was founded in 1997. The first developed 3-star Baross City Hotel was finished in 2000. From this milestone the two owners were continously operating, purchasing and developing hotels in different categories, slowly opening towards the premium segment. The first 4-star hotel was finished in 2007 which was followed by other boutique hotels – among them one in Vienna as well. 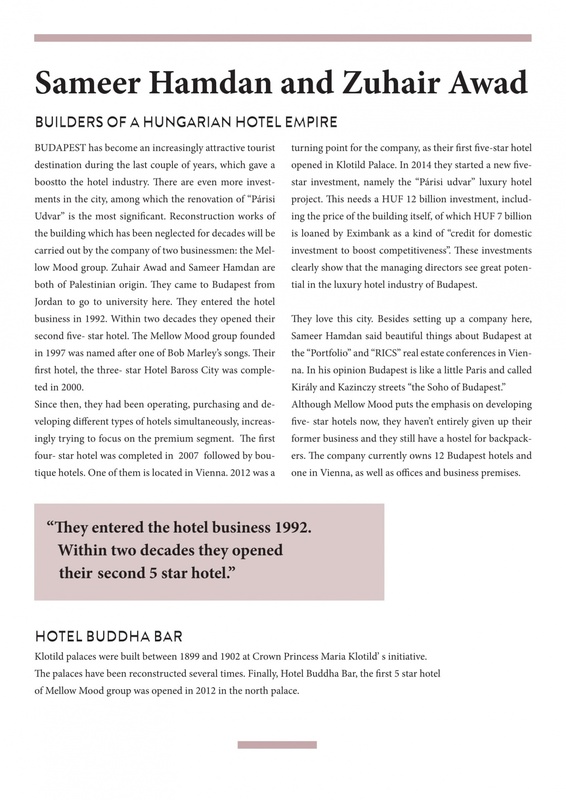 2012 was a milestone since the first 5-star hotel was opened in the Klotild Palace. Just from few meters from the Buddha-Bar Hotel Budapest Klotild Palace the renovation of the Parisi Udvar demands around 12 billion forint investment. All these developments clearly show that the two business man believe in the potential of the premium category hotels in Budapest. They both really like Budapest as they built their company here and Sameer Hamdan even said a related comment on Portfolio.hu RICS real estate conference. He considers Budapest as a little Paris and the Kiraly and Kazinczy street and the surrounding as a „Budapest Soho”. Although Mellow Mood is opening to the premium segment the company has still not given up on some of the initial business as for instance a hostel in the downtown. The company portfolio has 12 hotels in Budapest and several office buildings and business premises.